Combine all ingredients in a large pot. Bring to a boil, then simmer for 10 minutes. Refrigerate until cold. Place turkey in large stockpot. Pour cooled brine over the top, adding additional water as necessary. Refrigerate for 24-48 hours, turning bird occasionally. For a crisp skin, remove bird from brine, pat dry, and place in a roasting pan overnight (uncovered). Preheat oven to 500ºF. Roast turkey for 30-40 minutes. Reduce oven temperature to 350º and bake until bird reaches an internal temperature of 160º in the deepest part of the thigh. Using this technique, a 14 pound bird should require a total of about 2 hours for roasting. Smoke with Apple or Cherrywood. In a traditional smoker, you should figure you’ll need about 30 inutes per pound when smoking at about 230 degrees F. We use an Orion Convection Cooker with amazing results. 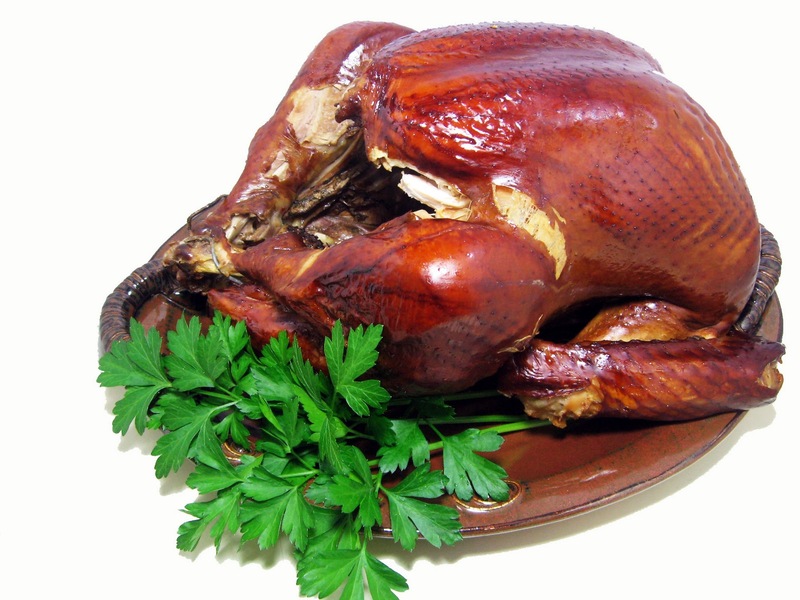 Cooking time is about 7 minutes per pound (1 ½ hours for a 12 lb bird). What a delectable looking turkey! I'm ready for Thanksgiving now :-) Thank you for sharing another delicious and inspiring post. I hope you have a great Monday full of laughter and love. This was the best Turkey I've ever had. We did not smoke it though. We cooked it in our NuWave oven and it was incredible!! Even as leftovers the turkey was still flavorful and moist (yes, even the white meat). We're so pleased you enjoyed it! This is, hands down, our favorite turkey. And it is delicious smoked or unsmoked (we've done it both ways). glad you tried it! I used this recipe 4 years ago in my Orion Smoker. From that day forward I was mandated by my family as the official Thanksgiving Day turkey preparer! My 97 YEAR OLD GRANDMOTHER, who I considered a gourmet quality cook, said it was the most moist turkey she had ever had. Robert, my 7 year old twin niece and nephew, 15 year old daughter, and 16 your old niece have never complained of it being to spicy, and remember, this is my 4th year doing it! Happy Thanksgiving to All 2015!! !